How do you help online brand owners both reduce the abandonment of a shopping cart by online shoppers—and also get the word out about their brands? Los Angeles-based Gatsby (www.thinkgatsby.com) has come up with a way to combine both ways to promote social sharing, as well as reduce shopping cart abandonment, via discounts which change depending on your social influence and sharing activity. We spoke with co-founder Brett Bernstein. Brett Bernstein: First and foremost, we are allowing any customer to be an influencer. Our primary, target audience are brands themselves. For example, say you are shopping on a website like Helix Sleep. Because it's a high ticket item, there's a good chance you won't be purchasing a mattress when you visit. To help them convert more visitors, we allow brands to give visitors a discount, and we make that discount intelligent. To get a discount, we ask customers to share information on the brand on Twitter and in the future, other social networks, and that discount is based on how influential they are for that brand. The number one metric we are targeting with Gatsby, is the pre-conversion and abandonment rate. While there are other companies trying to help companies with social influence, they are mostly trying to do this post conversion, and trying to measure influence of customers after the transaction. We're doing that before the transaction. Where did the company and idea come from? Brett Bernstein: First of all, the company is called Gatsby for a reason. I love the book The Great Gatsby. What I recognized in that story, was the character, Jay Gatsby, has these elegant and massive parties at his home, with very little or no invitations sent out. It was all word of mouth. He brings in a crowd with word of mouth, if that makes sense. Gatsby was a pivot on a couple of other ideas. My background before Gatsby was at Box, and before that, I had a company called Natural Cravings, where we helped with natural food vending in school districts. Brett Bernstein: Natural Cravings was my first company. I was just 22, coming out of college, and my dad had made a hobby of the business in San Diego. Me and my friend Andrew took my dad's hobby, and turned it into a real business. We focused on school districts in the Bay Area, and contracted to provide them with vending of natural foods. At the time, Michelle Obama was promoting health concerns with children, and schools heard about our vending machines. They'd tell us they were removing their Coke and Pepsi machines, and they needed us to help provide our services. That worked out very well, and I learned a lot about business and partnerships, and pitching to large organizations. How willing are users to tweet for a discount? Brett Bernstein: So far, it's been very well received. The first set of discounts is a set, $50 off at Helix Sleep. We're not testing the algorithm on influencers yet, but so far in testing, people have been willing to share the brand on social media for that discount. So far, it's been promising. What are other ways you are testing this? 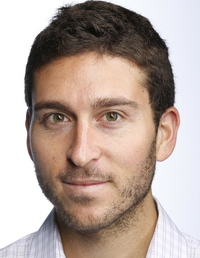 Brett Bernstein: With Helix Sleep, we've launched some A/B testing. Some users don't see the offer from Gatsby at first, and might need to reload their browser a few times to see the discount. We're tracking a bunch of data points, including tracking the influence of users on social media, and seeing how they tweet and share and promote the brand. Every mention of the brand provides a custom link to the brand's website, which is how we monitor activity, as well. Is it difficult to gather that data on influencers? Any plans to expand this to other social networks? Brett Bernstein: Yes, Facebook will be out shortly after this, and although we don't want to give away too much, we definitely have a roadmap. Brett Bernstein: This is our first brand, and we're pushing out to additional brands next week. We're targeting brands in different industries, to maximize the value of our testing, and we're also starting fundraising now as well.